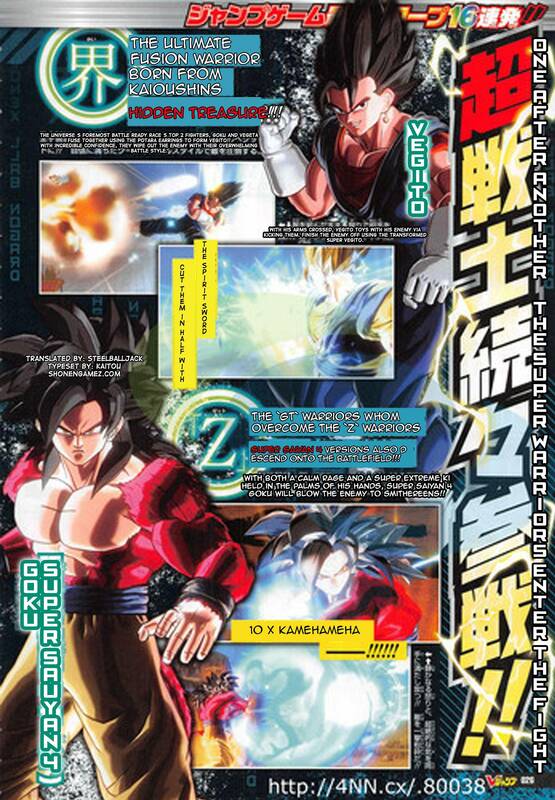 The latest issue of V-Jump magazine confirms that both Vegito and Super Saiyan 4 will be joining Dragon Ball Xenoverse as playable characters. Additionally, it confirms that the game is scheduled to launch in Japan on February 5th, 2015. Dragon Ball Xenoverse is coming to the PlayStation 4, PlayStation 4, Xbox One, Xbox 360 and recently announced, to the PC via Steam as well. sergio was right, and febuary is 4 and a half months away so i think we are gonna be getting little news like this a lot more often. this game is shaping up to be the best one yet. So am I it’s been a long time, it looks like they are finally making a solid and diverse roster again. Yeah but Im hoping they fix up the gameplay. Even though I know they are. All that really needs to be fixed is the dashing control and hit sync and corner camera angles, the rest is pretty solid besides little glitches. KAMEHAMEHA x10!!! Feels good to be home. Soon as we get it we’ll put it up. Those were leaks. It comes out tomorrow I believe.